September 1 of a recruit’s junior year is set to become the most important date on the recruiting calendar across the board.In an effort to stem early recruiting, the NCAA Division I Council adopted legislation on Wednesday that more resembles the schedule regular students follow when choosing a college. Scott Treibly speaks about Recruiting Education at the HBCU Championship high school combine day. The USTA ALL-American Combine took place on the the National Campus in Orlando, Florida June 14-16, 2017. Scott Treibly helped organize the event and conducted the Recruiting Education seminars. Scroll through the images to see what it was like! This June, American junior players will be able to show off their tennis skills and demonstrate their measurables for college tennis coaches from all levels - as the USTA Player Development hosts the inaugural USTA All-American College Combine at the the USTA National Campus at Lake Nona in Orlando, Fla. The USTA All-American College Combine scouting event, which will be held June 14-16, is designed to give U.S. junior players exposure, knowledge and data to help in their college recruitment. 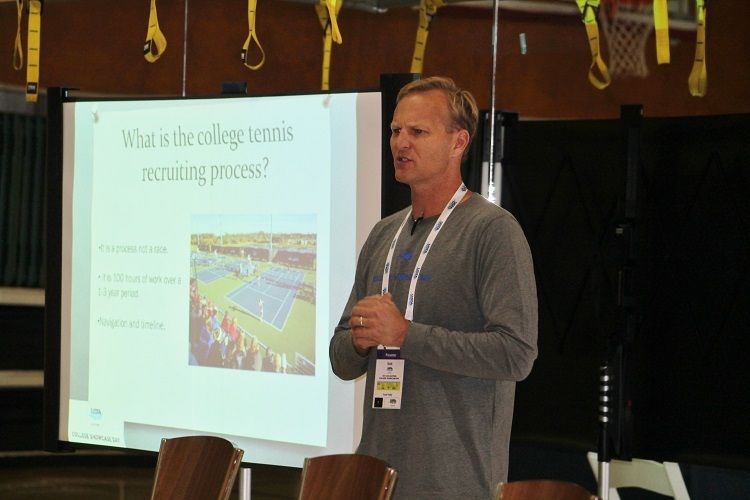 Tennis Recruiting (TRN): First question is to level-set. How would you describe the USTA All-American Combine to someone who knows nothing about it? Scott Treibly (ST): The USTA All-American Combine is a chance for American tennis players in high school to play and gain exposure in front of college coaches. Players will play fast sets to 4 over a three day period - and they will also participate in fitness testing and recruiting seminars. TRN: When I think of a combine, I think of the NFL - where there are measurables in terms of speed, power, etc. You mention fitness testing - what sorts of statistics will the USTA All-American Combine measure? ST: We will be measuring tennis specific speed, power, agility and flexibility. Players will be able to take back this information to their coaches and fitness coaches to build on. It also is a way to showcase them in a new way to college coaches. TRN: Will college players be involved? ST: The All-American Combine is for junior players. We understand the recruiting landscape and have made this for American juniors only. We hope to add exposure and knowledge in the college recruiting process. TRN: The match play will count both for Tennis Recruiting and Universal Tennis ratings. Yes. As you know, the event is a TRN National Showcase, so the tournament will allow juniors who participate to work towards being National Players at TRN. The event will also be imported into the Universal Tennis results database - so the results definitely count for player ratings and rankings. TRN: You mention an educational component to the combine. What kinds of sessions are you planning? Are parents welcome in addition to players? ST: There will be a recruiting education talk among other seminars, but this about junior players being showcased in front of college coaches. Parents are absolutely welcome to attend the USTA All-American Combine. TRN: Do you have an idea of how many coaches? And from what levels? ST: We are expecting over 75 college coaches from D1,D2, D3, NAIA and JUCO. At the time of this release we are working on the RSVP list for college coaches. The program takes place at the brand new USTA National Campus at Lake Nona in Orlando, Fla.
TRN: What areas of the National Campus will participants get to see? ST: They will see the entire facility including the Collegiate Center and the USTA Player Development building, where many of our top pros train such as Madison Keys, Frances Tiafoe, Cici Bellis, and Reilly Opelka. The matches during the Combine will take place on the Team USA Hard Courts. TRN: Finally, what are the goals for the USTA All-American Combine? How will you know if it is a success? Scott Treibly working the sideline during College MatchDay at the University of Georgia. Scott Treibly holding the NO AD paddle while covering the action. Scott helps promote University of Florida v Florida State matches at the Home of American Tennis. The match had 1756 in attendance and was broadcast on ESPN. Scott Treibly with ESPN's Patrick McEnroe at College MatchDay. The USTA Collegiate Division recently announced new NCAA Division I Men's and Women's College Tennis Top 25 Polls which kick off early next month. Every Wednesday morning throughout the college tennis season, the USTA will publish Top 25 lists based on votes from a panel of college tennis experts. Tennis Recruiting (TR): Thanks for taking the time to talk with us. To level-set for our readers, can you describe the USTA College Tennis Top 25? How does it work? Scott Treibly (ST): The USTA College Tennis Top 25 has nine voting members and will produce weekly rankings from February 8 through the end of the season. All voting members will submit their rankings on Tuesday, and we will release our rankings on Wednesday between 10am and noon Eastern. The rankings will reflect the Top 25 men's and women's NCAA Division I college tennis programs. In addition to the Top 25, we will also list teams receiving votes. TR: How did you select the voters involved with this poll? ST: We put a together a panel of voters who have in-depth knowledge of collegiate tennis. We did not choose D-I coaches in the inaugural season because voting weekly can be time consuming with the amount of data that is available. In the future, we see athletic directors, coaches and retired coaches possibly being involved, like they are for the football polls and rankings. TR: The poll is sponsored by the USTA Collegiate Division. Can you describe the Collegiate Division and its mission? ST: The mission of the collegiate group is to promote collegiate tennis on all levels. We want to make college tennis matches more into events. College MatchDay at the Home of American Tennis is going to be played at night, have a tailgate and put the matches on ESPN3. We want programs all over the country to promote and elevate their products too. College tennis is exciting and we want to bring it into the mainstream of collegiate athletics. TR: What are your specific goals for the Top 25 Poll? ST: We want people talking about college tennis matches, the coaches and the players. For years, the ITA has done a great job with their rankings at all levels - D-I, D-II, D-III, NAIA and JUCO. The USTA College Tennis Top 25 is just for Division I. We hope to help create more interest and conversation about college tennis this spring. TR: This sounds like a fun addition to the college tennis landscape. It also sounds like a first step. What do you think the future holds for these rankings? ST: We are so excited to launch the USTA Division I men's and women's Top 25 poll and cannot wait for feedback from collegiate tennis fans all over the world. We will engage the media so at the end of the season we have followers that want to attend and report on conference and NCAA Championships. In terms of any additional building blocks, we would like to continue to add knowledgeable voters to the panel - especially if they can help us promote college tennis.